Anyone who has ever attended one of my workshops knows that I do not like the simple classification of foot types based on “high arch” or “flat foot”. This type of classification system is too simplistic and does not really tell the practitioner anything about the mechanics of the foot. Instead, in my BTS Level 1 courses I teach professionals to begin to classify foot types based on subtalar joint (STJ) position. It is important to identify if the STJ is inverted? Neutral? Or everted? We must then understand how each STJ position can potentially impact injury risk or impede performance. As we begin to take our understanding of foot function to the next level we want to begin to consider midfoot biomechanics and how they relate to rearfoot or STJ position. In the BTS Level 1 courses we learn how to master the biomechanics of the rearfoot which includes the ankle joint and STJ. For those who attend the BTS Level 2 course we will begin to look closer at the midfoot or specifically the talonavicular joint. If we were to look at the foot from a medial view we can appreciate how the talus is sandwiched between the calcaneus below and the tibia above. This talar relationship is the foundation to foot function but what if we take it one step further and look how the talus is also in contact with the navicular distally. 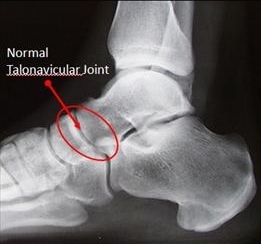 It is this talus – navicular relationship which is referred to as the talo-navicular joint or TNJ. The TNJ is responsible for translating inversion and eversion of the STJ forward into the midfoot and ultimately comprises what we often refer to as supination and pronation. Although I often do not discuss supination and pronation in the BTS Level 1 course, for the sake of this article and those who are looking to attend a BTS Level 2 course, we will begin to explore this concept. As mentioned earlier it is the STJ + TNJ which creates supination and pronation. When the foot supinates the navicular raises or shifts into a locked and stable position relative to the talus. This ultimately puts the posterior tibialis in a position in which is has maximum activation. When the foot pronates the navicular is essentially dropping down and the talus slides off of the joint surface. This alters the length tension relationship of the posterior tibialis which if you remember attaches to the navicular bone. Of these two the one we are going to explore closer is the pronation or TNJ plantarflexion and abduction – or what we will refer to as navicular drop. When determining navicular drop start with the client’s foot in STJ Neutral partial weight bearing. Mark the level of the navicular with a pen. 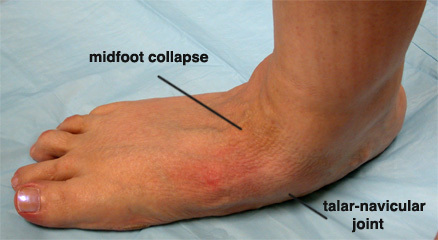 Measure the height of the navicular relative to the ground. Now have the client go into a full weight bearing position in their natural stance or what is referred to as relaxed calcaneal position. Measure the height of the navicular relative to the ground. Subtract the difference between the neutral STJ and the relaxed STJ navicular height. The difference is your navicular drop. A navicular drop of > 10 mm would be considered pathological. To see a video on how to measure navicular drop click below! Any shift in navicular position is ultimately going to impact the posterior tibialis as this is the muscle which attaches to this bone. As the navicular drops as in the pronated foot there is a shift in the lever arm of the posterior tibialis making it more difficult to activate this muscle. Since we often refer to muscles in relation to fascial lines we know that the posterior tibialis is part of the Deep Front Line. Running from the bottom of the foot up the adductors and into the pelvic floor, an over-pronated foot or foot with navicular drop can have a hard time keeping this fascial line activated. So what do you do if you have a client who has navicular drop? Ball between heels – Performing a calf raise with a ball between the heels (behind the medial malleoli has been shown to have some of the highest posterior tibialis muscle activation. This exercise is also a great way to integrate the posterior tibialis function all the way up into hip external rotation. Single leg glute exercises – Everyone knows I”m a big fan of barefoot balance exercises for the reason that it is a highly functional exercise for glute activation. Studies have shown that 6 weeks of glute strengthening can create a neutral STJ in a mildly everted foot.